LeeAndra Khan, principal of Gwendolyn Brooks Middle School in Oak Park. I am the proud daughter of a retired Chicago police officer who served for more than 25 years in Chicago’s housing projects. I have heard stories of violence, gangs and drugs. I have always had a strong respect for law enforcement, and I understand the dynamics of police-community relations from the lens of my father’s life experience. I am also the mother of a black boy, and we are currently in a state of tense police relations as it pertains to black boys. Speaking up about this tension is challenging. It’s one of the most difficult parts about being a black leader in the current racial and political climate. This difficulty is magnified when you are a school leader, and grows exponentially in a racially diverse environment. I currently serve as the leader of an integrated middle school in a diverse community. The achievement gap between black and white students is nothing new in this community and others like it. Racial disparities in school discipline are also nothing new. In fact, schools will be forced to directly confront the problem this fall because of the passage of Senate Bill 100, a law that aims to stop the school-to-prison pipeline by reforming discipline policies that disproportionately target black youth. Our current school climate is personal to me for several reasons, including the fact that my son, who attends one of Chicago’s best schools and isn’t an achievement gap statistic, is one of many black boys who have been suspended from school as early as 3rd grade. I have been a participant in suspending and expelling black students. I was conditioned to think that this was the only way to handle misbehavior. But I made drastic changes in how I approach such behavior in order to keep students of color in school and provide them with support to deal with their underlying trauma. I see equity through a personal lens, as a woman of color who is raising a black son. To illustrate this, I want to tell a story. It took place on a normal school day—actually, it was Trayvon Martin’s birthday, February 5th. Two black boys at our school were caught with “bang-snaps” in the hallway. You know the items I’m talking about–maybe you had a few as a kid during a 4th of July weekend. They make a popping sound when you throw them to the ground. Of course, I then had a restorative and reflective conversation about how having any kind of fireworks in the building was a violation of school policy. I told the boys about the potential dangers and the threat to safety that throwing these fireworks could cause. They assured me that they had no intention of using them in the building. However, they planned to let them loose on their walk home from school. Then, a surge of emotion and a rush of sadness came over me as I thought further ahead. One of the boys is easily 5’9,” at the tender age of just 11. He was wearing joggers and a hoodie. The scenario in my head went like this: As he walks down the street in his hoodie and with his “Beats by Dre” headphones, listening to his favorite rapper, he decides to throw the bang-snaps to the ground as planned and keeps moving. Unfortunately, some stay-at-home mom or dad, or retiree, hears the three “pops,” looks out the window. And instead of seeing a 6th– grade boy, they see a black man wearing a hoodie, who may have let three gun shots ring in the air. So they call the police and give that description of a “suspect.” The 11-year-old boy, walking home from middle school and listening to his music, turns the corner and to his surprise, he is greeted by officers with their guns drawn. He has no idea why. This is what flashed through my mind as I decided on my next intervention for these young boys. How awful that I have to process this. And do I share this story with them? While deciding whether to suspend them or not, I also have to wrestle with the idea that teachers will want to know “what happened” and parents will ask if the school they send their student to is safe and how I am dealing with “assailants,” implying that 11-year-old boys are criminals. Speaking up for your race is often viewed as exclusionary and you can even be accused of being a racist. A case in point: I was having a conversation with my staff about the discipline disparities in our school, mainly about the number of school referrals (cases of student misbehavior in which a teacher has asked a school disciplinarian for help) for black students. In the interest of full transparency, I made the statement that I wasn’t comfortable subjecting my own black son to such an environment. This statement was met with anger, accusations of racism and many complaint letters to the board. Trying to hold the students who look like you accountable for social standards that may marginalize the very essence of who they are feels wretched. You may be forced to rob the students of their innocence with constant redirection to social norms because black girls look “different” in the same length shorts as other girls, or black boys look like they are fighting while other boys are just horsing around. You must be careful about who you are seen with. You can’t spend too much time with the other black employees, because you don’t want to appear to favor them because of their race. Conversely, you have to consider how the black population views your time spent with others. I was once accused of not being “black enough” by a local school council because of my close relationship to the white population in the school. Engaging in conversations about race and natural biases makes people uncomfortable. White people may become defensive, as if you are accusing them of starting slavery. Then they become the victim very quickly and feel the need to defend and explain their actions–when all you are trying to do is change how we as educators see and treat children. You have to carefully craft the way you have these courageous conversations. Talking about race and equity, and about the documented mistreatment of specific groups of people, requires skill so that you don’t offend people and their efforts to change. Finally, it’s not the message that makes them uncomfortable. 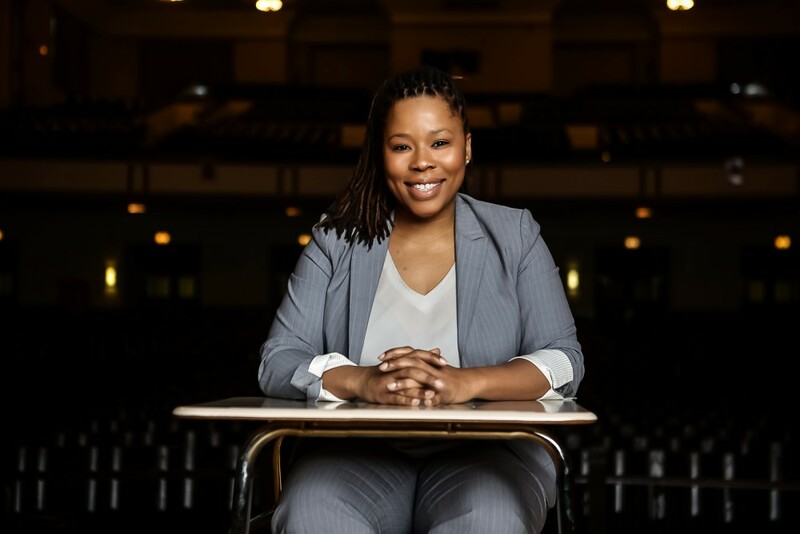 It’s the package that the messenger comes in: unapologetically black, with dreadlocks, full lips, a full figure, a proud resident of a black community with a son named Ausar Kemet Khan, completely devoted to making black lives matter and always fighting for equity for ALL students, especially those who have been underserved. The struggle is real, but this is leadership on the ground and we must actively look for solutions to problems. To start, leaders can’t be afraid to have tough conversations about race and inequality. Districts need to invest time and money in developing school leaders and teacher-leaders on how to facilitate these conversations. And leaders are best supported with data and with narratives from and about children. Second, it does take a village. Support from organizations with professionals who specialize in dealing with trauma should be a staple in most schools. This support is not just for the children who experience trauma in their communities, but also for the adults, so they can understand the effects of inter-generational trauma and how larger forces affect us all. It is our job as educators to make students feel valued and give them the sense that they belong in the academic community. Lastly, I believe that an acknowledgement of white privilege and societal bias against people of color helps to bridge the communication gap between groups—because mistaken beliefs about students of color are at the root of the achievement gap, the disparities in discipline and the problems of race, lack of access and inequity in schools. LeeAndra Khan is a former Chicago school principal. She is now principal of Gwendolyn Brooks Middle School in west suburban Oak Park. Embattled Blaine Elementary Principal Troy LaRaviere will face retired Prosser Career Academy Principal Kenneth Hunter in next month’s elections for president of the Chicago Principals and Administrators Association. Ballots go out next week and will be counted on May 20.